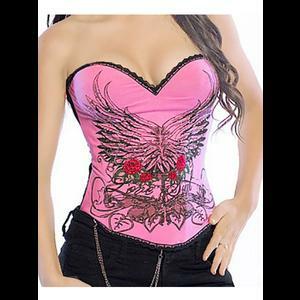 A lovely detailed corset made from lined stretch bright pink cotton with a tattoo style wings and roses print on the front. The printed design is decorated with lots of little sparkling stones. The bust area is lightly padded and the top and bottom of the corset are trimmed with narrow black lace. The back is plain black lycra with a three-position hook and eye fastening. The corset has 5 concealed plastic bones at the front, one on each side seam and two at the back. It comes with detachable elasticated shoulder straps and a bronze chain that can be clipped to the lace edging as shown in the photo. Bust: 26" to 28" Waist: 24" - 26" Length: 11"
Bust: 28" to 30" Waist: 26" - 28" Length: 11"
Bust: 30" to 32" Waist: 28" - 30" Length: 11"
Bust: 32" to 34" Waist: 30" - 32" Length: 11"
Bust: 34" to 36" Waist: 30" - 32" Length: 12"